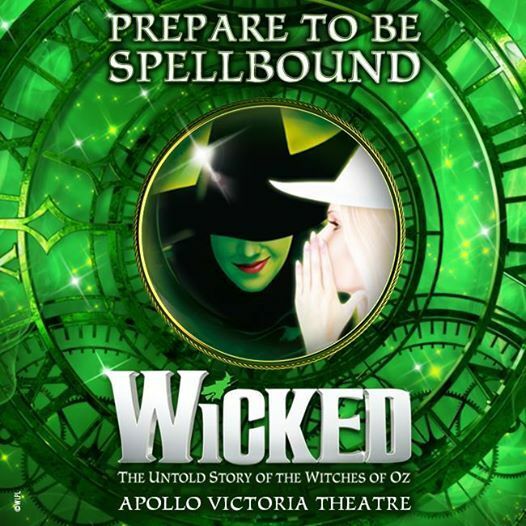 Wicked the Musical the smash hit musical that tells the incredible untold story of the Witches of Oz, is “the must-see wonder of the West End” (Andrew Pierce, LBC Radio) and currently booking for all performances until 25 May 2019 at London’s Apollo Victoria Theatre. Based on the best‐selling novel by Gregory Maguire that ingeniously re‐imagines the stories and characters created by L. Frank Baum in ‘The Wonderful Wizard of Oz’, Wickedtells the incredible untold story of an unlikely but profound friendship between two young women who first meet as sorcery students. Their extraordinary adventures in Oz will ultimately see them fulfil their destinies as Glinda The Good and the Wicked Witch of the West. Wicked has music and lyrics by multi Grammy® and Academy® Award-­winner Stephen Schwartz (Godspell; Disney’s Pocahontas and The Hunchback of Notre Dame) and is based on the novel ‘Wicked: The Life and Times of the Wicked Witch of the West’ by Gregory Maguire and adapted for the stage by Winnie Holzman. Musical staging is by Tony® Award-winner Wayne Cilento and the production is directed by two-time Tony® Award-winner Joe Mantello.“The gravity-defying ‘Wizard of Oz’ prequel” (Time Out London) is the recipient of 10 theatregoer-voted WhatsOnStage Awards (winning ‘Best West End Show’ on three occasions) and two Olivier Audience Awards.